keeping check of what needs topping up is a mammoth task. So here is what I consider the perfect changing bag kit. 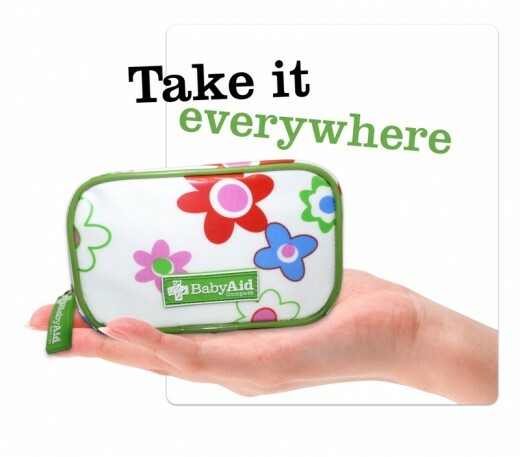 and the main reason for this article: Baby Aid, the compact first aid kit for babies. Having looked and never found a suitable first-aid kit that I can take with me, I was absolutely delighted to find this new product on the market. Small enough to fit into a 'normal' sized changing bag or handbag, it is packed with everything you could need for any little emergency. There is also a leaflet giving detailed directions for the more major emergencies when 999 is not over-reacting! I think that would just about cover most crisises! So I have bought one for myself to keep in my very reasonably sized changing bag and bought a box full to sell on my website because I am confident that every mother will want to have one with her when she is out and about with her baby!